After a 33-month transition, this morning the Pope accepted the resignation of the Latin patriarch of Jerusalem, Archbishop Michel Sabbah, clearing the way for the ascent of his coadjutor, Archbishop Fouad Twal, into the post leading the church of 70,000 in the place that's been called the "Fifth Gospel." Patriarch since 1987, Sabbah -- the first native to hold the historic post, first established in the 11th century -- reached the retirement age of 75 in March. 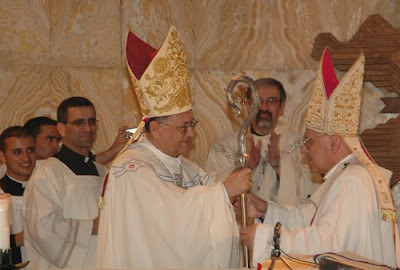 Born in Jordan (also part of the patriarchate, together with Israel and the Palestinian territories), his 67-year old successor rose through the ranks of the Vatican's diplomatic service before serving as bishop of Tunis and being named as Sabbah's successor in waiting in September 2005. Given his background, the new patriarch -- the 55th holder of the post -- is expected to bring a changed tone to the top post; Sabbah's partiality on behalf of the Palestinian cause made the prelate something of a lightning rod during his tenure. What, Monsignor, will be the place of politics in your mission? Me, I prefer to act as a bishop. I like to emphasize the pastoral and spiritual aspect of our Patriarchate, our parishes, our parishioners, our religious communities and the pilgrims who come to us. Of course, I cannot forget that everything that touches mankind touches the Church. Politics concern me to the extent that they affect people’s lives, dignity and security. But I want to pay close attention. We have three or four groups of believers before us. Christians and non-Christians, Jews and Muslims. Among Christians, there are the Jordanian Christians, Palestinian Christians (who are the ones who suffer the most), European Christians who are here to help, work, study or make pilgrimage, and there are also Israeli Christians, Arabs or of Jewish origin. All these groups do not share the same sensibility, including their vision of the conflict. Hence, the difficulty in speaking. Because the bishop is everyone’s bishop, absolutely everyone’s. Either we want our discourse to touch everyone or we favor one group - which is the easiest - or we have as many discourses as groups, which is not possible. But if you want to touch Jews, Muslims, Christians, Jordanians, Palestinians, Cypriots, Europeans all together… then you have to consider every comma. I am well aware of the complexity of speaking out, whether it is a speech or a sermon. And how do you see coping with this difficulty? Spiritually! You might say that that is the easiest, but it is also the role of the Church to attract mankind toward the things above. But you will be asked for a political message. Journalists aren’t satisfied with the spiritual! Ah, journalists… When I was the bishop of Tunis, they asked me about Islam. One day I said to them, "I am waiting for someone to ask me about Christ." I am truly waiting for someone to ask me about Christ, the Church, the essence of our Christian life, our presence in the Holy Land. Perhaps I will disappoint journalists in politics, but once again, politics touch us in that they touch mankind. That being so, there is another dimension. And exactly that, everything that we experience, including the difficulties engendered by the conflict, should send us to the Gospel. We should take the Gospel literally. When the Gospel speaks to us of the Cross, of suffering, when we see Jesus fall… and get up again. We should reflect that the disciple is not better treated than the master. And that we follow the path that he followed before us. But when in spite of everything we are moving forward, when in spite of everything we find the strength to live and the joy of living, the joy of preaching, the joy of proclaiming the Gospel, it is not because of the geopolitical conditions that surround us, for by their nature they change: one day they are favorable, the next day unfavorable. No, this joy comes to us from the Gospel. This joy comes to us from the One who tells us: "Fear not, I am with you… I give you my peace, MY peace." His peace, which is interior serenity, which is interior joy, which is joy in living, joy in encounters, joy in accepting others, all others, just as they are, with their limits, with my limits. Our joy is not founded in an improvement of the situation; the reason for our joy is meeting Christ himself in prayer and in meeting others and being in solidarity with them. If not journalists, there are others who will court you in political territory. I am inclined to meet everyone, to receive everyone. I have no complexes. I spent, may I remind you, eighteen years in diplomatic life. Those years taught me a few little things… Moreover, they opened my mind, my heart. And my faith, my mind, my heart, my charity, my love do not limit themselves to the borders of the diocese. We must love everyone. All the citizens of the countries covered by the diocese are my citizens. All the residents of the Holy Land are mine, in one sense. Before God, before history, I feel responsible for everyone. And at the same time, I am 100% aware of my limitations. I know that I will never work a miracle, but I want to sow seeds, I want to work with my brother bishops, with the priests, the religious brothers and sisters and the faithful, leaving the results to the good God… as He desires, when He desires. In the present, very complicated situation, it is perhaps better to love more, pray more and speak less, even if this is not the joy of our journalist friends. You speak of sowing seed… And what seed are you going to sow, Monsignor? The joy of living! The joy of living as a Christian. The Holy Land is a country that teaches us patience. I told you that when a file comes to the Vatican Secretariat of State marked "Urgent", one always takes as much time as necessary. The Church does not live in urgency; it has all of eternity before it. In the diplomatic service, one is sometimes reproached for having spoken too much or too soon… One is never reproached for having remained silent. It is also true that too much prudence runs the risk of paralysis, and I don’t like that either. We must join prudence with the courage to speak. And know our limitations. Faced with the complexity of the situation, it is necessary to accept, listen to and be acquainted with all points of view. Above all, it is necessary to entrust all of this to the good God in prayer and silence. In the presence of the grand master of the Equestrian Order of the Holy Sepulchre, Cardinal John P. Foley, Sabbah formally passed the crozier to his successor at a thanksgiving liturgy (homily) tonight in the Basilica at Gethsemani. 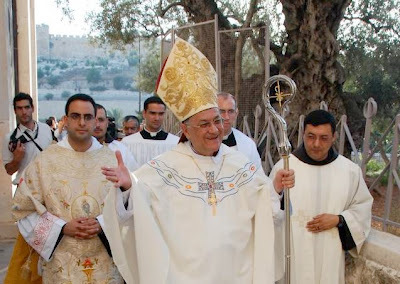 Twal will be formally enthroned at Jerusalem's Basilica of the Holy Sepulchre tomorrow and make a pilgrimage to the scene of the Nativity at Bethlehem on Wednesday before leaving for Rome to receive his pallium from Pope Benedict at next Sunday's annual conferral to mark the feast of Ss. Peter and Paul.